Celebrating the life of Geneva’s legendary jazz bass hero Scott LaFaro has become an annual event at the Smith Opera House, ever since the City of Geneva declared April 3, his birthday, as Scott LaFaro Day in 2014. There is also a street off of Seneca Street, just across from the Smith Opera House, that has been renamed Scott LaFaro Way. 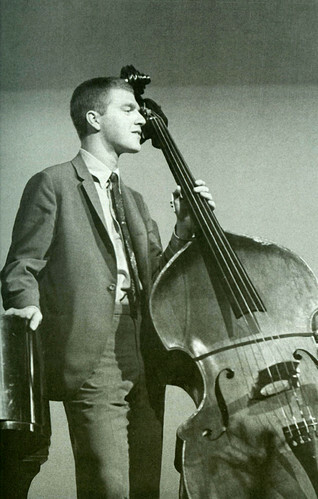 Each year during the first week of April, The Smith hosts the Scott LaFaro Day Celebration concert that features a contemporary bass player. That show typically includes stories about LaFaro, who forever changed the jazz world’s concept of what bass playing could accomplish with his counter-melodic style. This year The Smith is excited to have National Endowment of the Arts Jazz Masters Kenny Barron (piano) and Dave Holland (bass) together on stage on Saturday, April 6. You can read our interview with Holland here. In LaFaro’s short yet meteoric career, he accomplished more than most musicians do over decades. While his music education began in grade school with piano and then clarinet and tenor saxophone in junior high and high school, he didn’t start playing bass until his senior year, and only because a string instrument was required for his enrollment at Ithaca College, where his intent was to major in clarinet and tenor saxophone. He felt such a strong passion for the bass that he became obsessed with practicing, spending countless hours in the rehearsal rooms at Ithaca College. Not long after he arrived on campus, he gave his clarinet away to a classmate. LaFaro completed his first year at Ithaca, but not his second. A professor encouraged him to audition for an open spot in the Buddy Morrow Orchestra. Once he got the gig, his college days were over. LaFaro went on to perform with Victor Feldman, Chet Baker, Benny Goodman, Stan Kenton, Stan Getz and Ornette Coleman. But he was best known for his collaborations and recordings with the Bill Evans Trio. Tragically, LaFaro’s chance to see how far his talent would take him was cut short when he died in a car crash near Geneva in July 1961 at the age of 25. Nearly six decades later, Helene LaFaro-Fernandez continues to keep her older brother’s flame alive. In 2009 she published a biography about him, Jade Visions: The Life and Music of Scott LaFaro. Having followed him out to Los Angeles in the late 1950s along with the rest of the LaFaro family, LaFaro-Fernandez still lives in California and continues to answer daily inquiries about her brother, conduct interviews, and ensure his legacy will inform musicians and fans for generations to come. We spoke with LaFaro-Fernandez by phone to give us a glimpse on her brother’s formative years in Geneva. Here is a verbal snapshot of that conversation, edited for clarity. Q: What were Scott’s childhood and teen years like here in Geneva? LaFaro-Fernandez: Scotty and I were born in New Jersey but we moved back to Geneva in 1942. Our Dad was from here. It was an idyllic childhood. We would explore all around our neighborhood on West Street — our house was where the elementary school is. Later we moved to Elmwood Place, and during the summer we would spend many of our days at the Brook Street Playground. There is a creek that ran through the park, it would go up past Shuron Optical where they used this rouge chemical to make glass lenses, so the creek was always red. Everyone would say “Don’t go to the creek!” but we did anyway, and would come home with red shoes. Q: Did you and your brother spend time at the Smith Opera House (which was Schine’s Geneva Theatre back then)? LaFaro-Fernandez: On Sundays our family would go to church, then go to the movies in the afternoon. Then we’d go home and have dinner and ice cream. That is what so many families’ Sunday ritual were like. Later in high school, kids would go to the movies with their friends, or boyfriends, or girlfriends. On date night, people would end up at The Smith. We never got to enjoy it as a concert venue in our day, unfortunately. Q: When did your brother start getting interested in music? LaFaro-Fernandez: When Scotty was in sixth grade we took our first piano lessons. I quit very fast, but he was a natural. After that touch of piano, he really started to enjoy music and develop a keen awareness of what it was all about. It was then he fell in love with the tenor saxophone. When we were in junior high school, Godfrey Brown, the head of the high school music department, would come there to recruit for positions they needed to fill in the band and orchestra. They needed a bass clarinetist, and he promised Scotty that he would be allowed to play clarinet and eventually the tenor sax if he took that position. We also spent time at the First Presbyterian Church choir. My dad loved the director, so we had to go and have that experience as well. Q: What kind of influence did your father have on your brother’s music? LaFaro-Fernandez: Dad (Joe LaFaro) never forced us to play music. He waited until we got interested, and then he was totally supportive. He was a musician from age 4. He was playing mandolin and violin publicly by age 7. At age 12 he was recommended for the Ithaca Conservatory of Music, where he was classically trained in violin. He became a professional musician in New York City during the Roaring 20s. During World War II the club scene changed and he came back to Geneva where he could find work. He played in a trio or quartet at Belhurst from the time he got back until he died. The Sampson Air Force Base was so big that it brought in big names like Duke Ellington. Also, Club 86 was bringing in major stars as well. My dad took Scotty to see anyone who came there, or to Syracuse or Rochester. In high school Scotty played clarinet and tenor saxophone, in spite of not being happy about a lip injury he got playing basketball at the Y. He took up bass because he was required to play a stringed instrument at Ithaca College. He got his first professional experience playing bass at Belhurst (with my father’s group). They spent so much time discussing music, listening to records, at the piano, they were inseparable. Q: What happened to your brother after Ithaca College? LaFaro-Fernandez: After Scotty joined the Buddy Morrow Orchestra, he traveled with them all over the country until they reached California, as he really wanted to be where the West Coast jazz scene was happening. It was there his career exploded. Everyone heard him. Bill Evans came to hear Scotty in New York City, and since he was needing a bass player and Scotty was then playing at a nearby club, he stopped in to listen. Shortly after, their collaboration began. Scotty had the concept for a trio to be conversational instead of the classic structure, instead of bass and drummer just keeping time. He wanted the conversation back and forth between each of the players, and he wanted to play melody. At the time it was such a revolutionary idea, and it ushered in a sea change for jazz. I was also told by classical bass players that this also changed things for them because as was with all music pretty much up until then, the bass was considered more of a rhythm instrument only. Scotty sort of led the way on the bass becoming a solo instrument in its own right. Q: Your family ended up following Scotty out to California. How did that happen? LaFaro-Fernandez: My father passed away (from a heart attack) in 1957. Scotty was on the road at the time, in California. My mom was still pregnant with my last sister. I was 19 and working. We decided to move the family to California. California had affordable education, and we could all go to college. Scotty and I rented a house for Mom and the girls, I got married a few months later and (soon) we all moved into a new house in a new development in West Hills. With my mom and Scotty and my two sisters and then our own kids, we eventually had to build onto the house. This was Scotty’s home, and he would practice bass facing the corner in the living room because he could better hear the sound quality. Q: So if you were all living in California, how was it that your brother was near Geneva when he died? LaFaro-Fernandez: After Scotty played at the Newport Jazz Festival with Stan Getz (July 1961), he went to Geneva to try to convince the people who had been renting our house to buy it. Mom needed the money. He was visiting some friends west of Geneva and was driving home late when he crashed. Scotty’s death was hard on my Mom. She had lost her husband, then four years later lost her son, and she still had young kids to raise. But we LaFaros have staying quality, and my husband and I just celebrated our 60th year in this house. I still have people from all over the world knocking at my doorstep, wanting to see where Scotty played. I get 10 to 12 emails a day asking about Scotty. It is still so wild to me that he was so influential.